The Cleve Carney Art Gallery begins its 2017-18 season with an exhibition of paintings, stoneware and works on paper by the artist Leslie Baum. "Leslie Baum calls herself a painter, but that hardly covers what she does. She is not wedded to a particular material or process. Her interest in remaking the same form (or, more precisely, silhouette) as a shaped canvas, on a sheet of embossed paper, or into a piece of ceramic arises from her curiosity about the relationship between perception and apprehension— how we see what we see — while her use of different mediums expands the historical definition of painting. 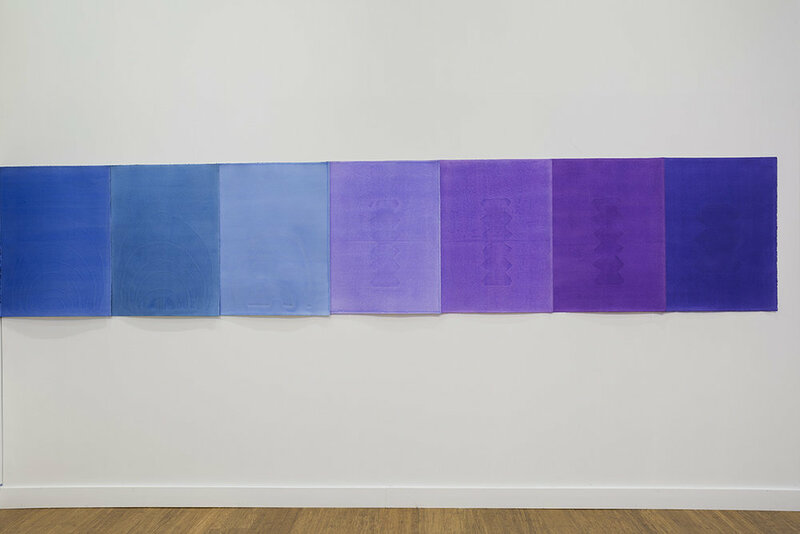 Contrary to the road taken by many of her contemporaries, Baum is a painter interested in the possibilities of installation, rather than an installation artist interested in incorporating painting into her work." - John Yau, from the "Here Comes the Rainbow" exhibition catalogue. Baum’s honors include nominations for the Richard H. Driehaus Emerging Artist Award (2005), the Richard H. Driehaus Individual Artist Award (2003). Baum was named “Best Emerging Artist” by Chicago Magazine (2004). In conjunction with the exhibit the gallery will host four mindfulness sessions on September 7th, 13th, 19th, & 25th, held in the gallery space. The artist has made meditation pillows, which will be used for the sessions. Each session will start off with 15 minutes of meditation followed by a discussion and viewing of the exhibit. All sessions begin at 11am. Learn more about the Mindfulness Sessions here. Exhibition Catalogue by Sonnenzimmer design with essay by John Yau.